Oregon starting pitcher Cheridan Hawkins must have dominance inscribed in her DNA, as her performances have left opponents baffled. Since game one of the season, Hawkins knew she would be Oregon’s x-factor in returning to the Women’s College World Series. In the UCLA series, Hawkins dealt with adversity for the first time this season as she lost the first game of the series and struggled in the second game before being removed. 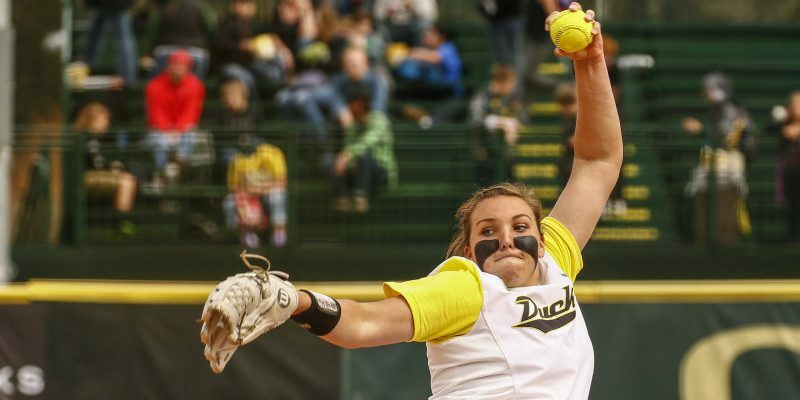 Looking to respond, she took the mound for the third game and led Oregon to victory. Unlike the first two games, Hawkins was efficient by mixing up her pitches with velocity to keep the hitter off balance, and she regained the dominating fashion that she had been in earlier games. Let’s look at her repertoire of pitches to see how Oregon’s ace has been effective on the mound. The rise ball has been Hawkins’ staple pitch. In her first two starts against UCLA, Hawkins was unable to have the ball break upwards. As a result, the ball was left hanging for the Bruins to deliver hits. In her third start, Hawkins had her rise ball working. The GIF above shows an effective high rise ball for the strikeout. Notice the break of the ball as it rises upwards to the glove of the catcher. The ball doesn’t begin to break upward until the tail end, just before it reaches the catcher’s glove. When Hawkins has her rise ball going, hitters are in trouble. Not only can Hawkins make her rise ball elevate dramatically at the end, but she can also throw a rise ball with a little break. The result is a slow rise ball. In the GIF above, the ball doesn’t break significantly upwards from a high rise ball. Having a small break on the ball pays off for Hawkins as the UCLA batter goes down swinging. The high rise and slow rise pitches have been Hawkins’ most efficient pitches this season. Although she struggled getting early command, she continued to attack hitters with other pitches to get out of the inning. When lacking command, Hawkins can resort to her other pitches to find a rhythm. Pitching through the back door? Here is an example of Hawkins’ curve ball breaking from the hitter left to right but painting the corner for a strike in the GIF above. During the game, Hawkins threw a combination of breaking pitches, keeping the Bruins off balance. Hawkins can also throw the drop ball, which as the name declares, is the opposite breaking pitch to the rise ball. Instead of elevating, the ball drops down toward home plate as seen in the GIF above. Notice how the ball dips before possible contact by the bat of UCLA’s hitter. The pitch is effective against a bunt, and can also be a great pitch for a strikeout. Breaks in pitches like the rise and curve ball need to occur as the ball crosses home plate. If the pitch breaks before the plate, the hitter will know to take a swing or take a pitch for a ball. Cheridan Hawkins was a different pitcher in her third start against UCLA compared to the first two starts. She attacked hitters to pick up the win. Coach Mike White was concerned starting her, but knew his ace would deliver as the Oregon Ducks ride on her performance. Although she faced adversity, it was good to face it against a tough UCLA team, rather than waiting until the postseason. Hawkins is not afraid of carrying the load for her team, and she will do whatever it takes to get back to Oklahoma City!